Calories: 400 kcal Ideal for: Those who want a well-balanced, satiating recipe with fiber, proteins and vitamins. Today’s post is all about merging nutritious food with pleasing aesthetics for a wonderful expereince. 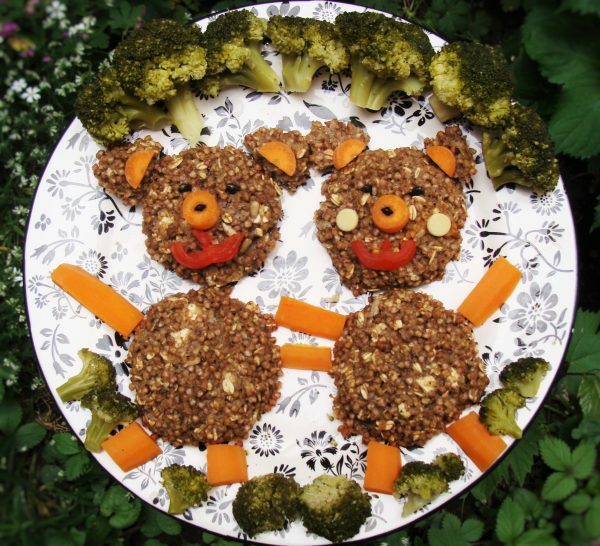 Since we LOVE bears (we are named Nutribear afterall), we decided to have a little fun and create something beartastic! Up next is a scrumptious, healthy and easy to prepare recipe for baked buckwheat balls with a colorful garnish of steamed vegetables. Shaping them like bears makes the whole process more enjoyable and in the end, you might feel sad ruining the masterpiece when eating it. I can assure you though, that they are so tasty and crunchy, that it’s worth it! Rinse and cook the buckwheat in 400 ml of water for 15 mins. It is better if you can pre-soak it for a few hours, rinse well and cook after that, so you can remove some of the phytic acid and make the most out of buckwheat’s nutrients. Then mix well with all the other ingredients in a large bowl. You can put the mixture in a food processor to blend even better. Form balls or shapes of your choice, put on a baking paper sheet and bake in the oven 180 degree Celsius until they start to brown (around 15 mins, depending on the oven). Be careful not to bake them for too long, as they might become dry. They should be just crunchy. Serve them warm with a garnish of your choice. In the picture, the garnish consists of lightly steamed broccoli and carrots. These two veggies are true super-foods and steaming them makes their nutritional benefits even greater. This recipe is well balanced, high in protein, complex carbohydrates, fiber and healthy fats. It is very satiating and it is suitable as a meal any time of the day – breakfast, lunch, dinner, even as a snack, if the portion size is cut by half. Suitable for vegetarians as well as for people, trying to lose weight. This is because buckwheat is a gluten-free grain, rich in highly digestible protein and fiber which are beneficial for the digestive system, heart and cholesterol levels. Broccoli is super rich in vitamin K, vitamin C, folate, chromium, the anti-inflammatory compound sulforaphane and an array of other nutrients. Carrots contain valuable amounts of antioxidants, especially beta-carotene. Eggs contain the highest biological value (or gold standard) for protein, meaning they provide a complete range of amino acids. You can experiment with the type of cheese and seeds, the garnish, the spices and even the type of grain (quinoa or millet would work quite well, too). The eggs will stick everything together, so you can experiment with shapes, too. Replace the eggs with soaked chia seeds and the cheese with tofu and you have a vegan recipe. Try this recipe and let us know how it turned out in the comments below!